The Late Show with Stephen Colbert Photo by Scott Kowalchyk/CBS ©2017 CBS Broadcasting Inc. All Rights Reserved. He was tweeting right up to the election that the system was going to be “rigged!”—perhaps to give himself some cover. Since then, we are the ones who need cover. Trump’s binary presidency—a pinging and ponging of warring beliefs, messages, and tweets—has brought much cultural fracturing. Every utterance drives an already polarized nation further into opposing camps. Unlike that old Miller Lite beer ad, which had people on differing sides screaming, “Tastes great! / Less filling!” we now have a population that reflexively sees things as fake or real, pro or anti; and it’s a lot less fun. Indeed, post-Trump, the political climate has become so pitched and adversarial that we’re losing the ability to speak civilly to one another. For the last eighteen months or so, people have been reporting that the ramped-up level of general antagonism is killing their sleep, diets, teeth, skin, family gatherings, and even long-standing friendships. 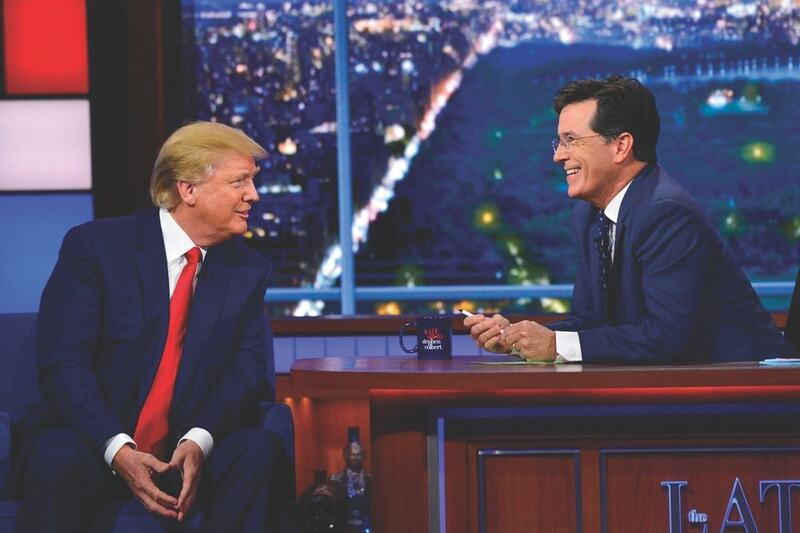 Donald Trump talks about his US presidential campaign on The Late Show with Stephen Colbert, Tuesday, September 22, 2015. And, just as Trump never “pivoted” to what most people consider presidential, his “stable genius” level of media manipulation, unique among presidents, is one of the biggest causes of anxiety in America. Every day, it seems, our first-ever reality-star president creates a meteor-sized media boulder that he himself packs, rolls, throws, watches to see how it plays out, and then reloads, to generate a massive self-perpetuating cycle: A Trump news-bomb cyclone. Add to that the Trump-reactive reinvigoration of deeply reported newspaper stories, now amplified by the juiced-up cable and online news outlets (all magnified on social media) and the anxiety avalanche keeps growing. Trump has created so much cognitive dissonance around the idea of “fake” that, ironically, people are trusting comedy (crafted by writers who endow the riffs with history, context, and satire) more than the news. For a nation in need of anxiety blankets, it makes sense that late-night comedic institutions like The Late Show and Saturday Night Live—sometimes watched while huddled under a duvet—have provided new comfort zones. It’s no secret that in Trumplandia, these shows now function less as classic entertainment and more as a release valve for collective venting. 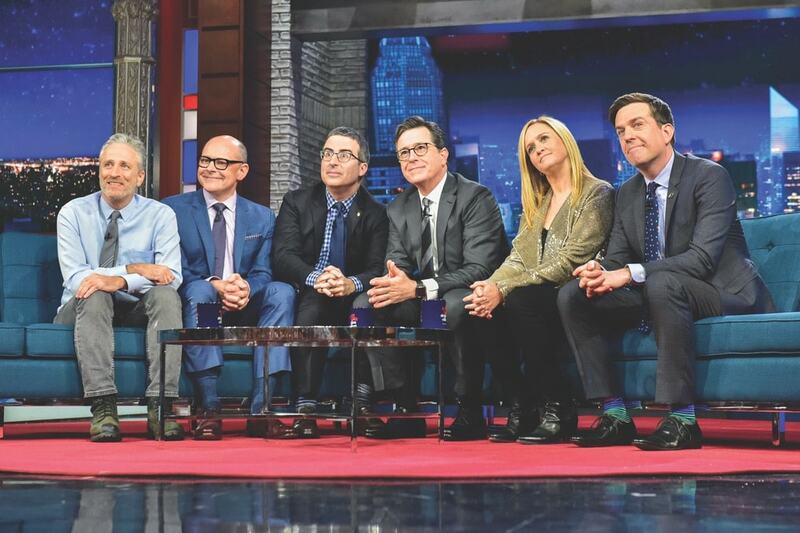 Guests Jon Stewart, Rob Corddry, John Oliver, Samantha Bee, and Ed Helms, join Stephen Colbert on The Late Show, Tuesday, May 9, 2017. Photo by Scott Kowalchyk/CBS ©2017 CBS Broadcasting Inc. All Rights Reserved. In some ways, Alec Baldwin’s blistering portrayal of Trump as impulsive, childish, and soon to go over the edge has become larger than life, larger than Baldwin, and larger than SNL itself as an antidote to the times. In turn, comedy gold has produced much-needed ratings gold for the forty-three-year-old show. Viewership for the series rose by more than 30 percent over the previous season, reaching heights it hasn’t experienced since the early days of the Bill Clinton White House. Indeed, no one has profited from a “Trump bump” more than Colbert, whose ratings started to shoot up as soon as he returned to revealing a political orthodoxy and made the Orange One his obsessive focus as a late-night opener. As with other politically inclined comedic TV hosts, such as John Oliver and Samantha Bee, Colbert got his start as a correspondent on Comedy Central’s The Daily Show with Jon Stewart, which became a clearinghouse for superstar comedic talent. Turning traditional TV news programming on its stiff, overly blow-dried head, Stewart brought a whip-smart, eviscerating take to everyday reporting. He regularly called his satiric bits “fake,” but even then, a younger, more digital generation recognized that what he was doing was somehow truer than what other news outlets were presenting, and they chose The Daily Show as their single filter. In 2005, Colbert graduated to his own show on Comedy Central, The Colbert Report, playing a caricature of a reactionary, right-wing, hugely self-regarding pundit, somewhat in Bill O’Reilly mode. 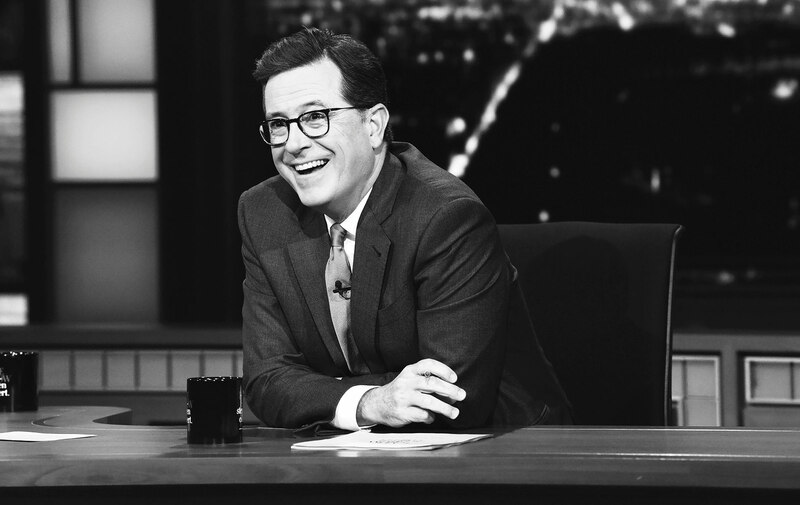 The role brought out his monster talent for parody and satire, so much so that in late 2014, CBS announced that Colbert would succeed David Letterman as the host of The Late Show. The Late Show with Stephen Colbert debuted in September 2015 with great anticipation. 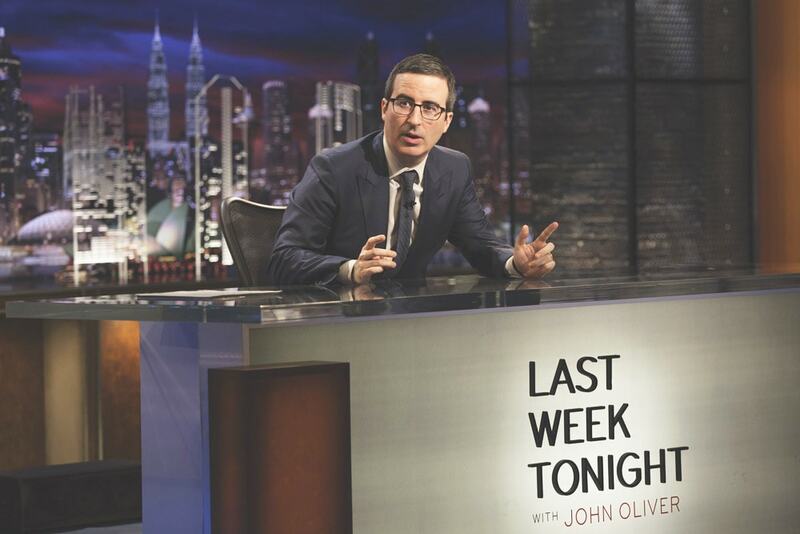 Last Week Tonight with John Oliver is HBO’s comedic news series recapping worldly events and politics each Sunday. Now effectively naked, however, without the protective cover of that ridiculously pompous character to play off, Colbert couldn’t quite find his footing, and the show and its ratings were flailing. That changed in 2016, when Colbert started devoting his opener to filleting Trump (and Melania). The ratings ticked up by 35 percent in 2017. Barbara Lippert writes about media, politics, ads, and women. Currently, she’s a columnist for Ad Age; previously she wrote Mad Blog for MediaPost.com, which started out as an episode-by-episode deconstruction of Mad Men. For many years she was an award-winning ad critic for Adweek and has also written for New York magazine, Vogue, Glamour, Newsweek, the Washington Post, and the New York Times. She lives in New York City.